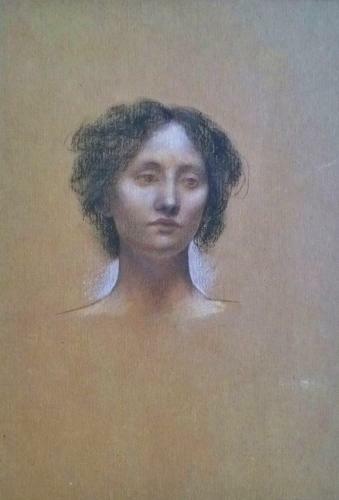 'Head of a Girl' by Evelyn de Morgan (1855 - 1919) Pastel and chalk on oatmeal laid buff paper. Overall size including frame: 30cm width x 50cm height. In removable period gilt gesso frame mounted during the 1930's. A fine and delicate drawing of a young girl by Evelyn de Morgan, a Pre-Raphaelite English painter. She is renowned for her oil paintings which are full of Pre-Raphaelite imagery, spiritualistic symbolism and strong feminist undertones, which also show her remarkable skills at drawing. Her style is distinctive in its rich use of colour, allegory and the dominance of the female form. Evelyn de Morgan was a successful and prolific artist exhibiting a range of her works from 1877 until her death in 1919. For more details of her works please visit the De Morgan Foundation website.